You’ve just landed a grant to study the economy of small Midwestern farming communities, and you choose the delightful little town of Cottonwood Falls, Kansas (pop. 903). But you only visit it AFTER it has been hit by a tornado. Or you want to study the social structure of Japanese fishing villages – but you visit them exclusively the day AFTER they have been hit by tidal waves. This might make sense if you are interested in the psychological effects of natural disasters. But if you want to see how a small Kansas farm town functions, or how people live in Japanese fishing villages, it’s a REALLY crappy study design. Makes about as much sense as slurping up a jar of pond stuff, looking at a slide, and thinking you’ve seen how a freshwater ecosystem functions. Sample some pond water, bring it home and let it sit quietly for a week under a light, and you may experience a fascinating sight: ghostly veils and arcs hovering in the water. After sitting quietly under a desk lamp for a week, a little thrift store aquarium full of water, pond plants, and algae from the Washington Park Arboretum developed these eerie white arcs hovering above a clump of algae (See arrow). They are very difficult to record -it is frustrating to persuade the autofocus on a camera to lock onto them – but with multiple exposures and much processing, it was possible to create a credible image. These are tentatively identified as Cryptomonad algae, possibly Chilomonas (thanks to Wim von Egmond and Vincente Meneu, Amateur Microscopy Facebook group). “In 2006 I noticed a discretely-shaped “veil” about 2 – 3 millimeters in extent, moving through the water of a mini-aquarium where I was also looking for hydras. The shape formed was like a section of an auger bit, or the twisted form of a DNA molecule (but only about 1/2 to 3/4 of a “twist”), and sometimes like a “saddle shape.” It also turned out to comprise something that looked most like Chlamydomonas, but I did not have good enough lighting (mirror understage only) to see bacteria. I have often wondered since then, how many people are aware of protozoans swimming in organized schools, and what mechanism they use to communicate their positions to each other. The shapes they formed had VERY definite edges (L. Hizer, personal communication, Facebook comment, 2016/09/24)”. As noted by Mr. Hizer, this phenomenon raises fascinating questions, . How are these swarms created? Is there a mechanism by which the cohesion of these protozoan “schools” is maintained? If so, on what basis does it function? Chemotaxis, light sensitivity, or some unknown mechanism by which protozoa sense each other, rather like flocking behavior in birds? The slide of the Cryptomonads also showed many slender bacteria – could this swarm be a collection of organisms clustering around a food source, rather like killer whales around a school of herring, or a response to some bacterial metabolic product? Many bacteria in a Cryptomonad swarm. What is their significance? Now transpose this image to the Bering Sea or a pond basking in the sun. Not only is the chemical environment different at different depths, but a large body of recent research suggests that every plant, invertebrate, or single-celled organism releases a cloud of chemicals in its immediate environment (see Blackburn). Many of these are vacuumed up by motile bacteria as food, while others serve as attractants for other unicellular creatures. Observing the motile bacterium P. haloplanktis, Vahora noted chemotaxtic attraction occurring within seconds when a single cell of the alga Thalassiosira was introduced into the culture. On consideration, this is not surprising; the world is full of gradients of chemical attractants and repulsants. Lemon sharks can detect tuna oil several hundreds of meters away at a concentration of one part per 25 million. Feeding releases blood and body fluids that attract more sharks, etc. Anyone who has observed a family hovering outside the kitchen while the Thanksgiving turkey cooks should immediately grasp the concepts of chemotaxis and nutrient patches. Coco Chanel has made millions from the principle of chemical attraction. Bacteria respond to external chemical stimuli through transmembrane “methyl-accepting chemotaxis proteins” or MCPs. After binding to specific chemicals in the surrounding fluid, MCPs transmit the message across the membrane into the cytoplasm, where Che proteins are activated. One Che protein type interacts with the “Flagellar Switch Protein”, changing flagellar rotation from counter-clockwise to clockwise and causing a tumble. Changing tumble frequency biases the random walk toward the higher end of the gradient, and the whole population drifts in this direction. This is discussed in Wikipedia’s article on chemotaxis. This is how a cloud of bacteria move. So what happens in an animal or plant, non-bacterial cell, when chemotaxis occurs? You can thank all those little creepy organisms in the soil and water billions of years ago for doing the basic R&D. The mechanisms they developed seem to have worked, because we are still using the same chemicals, whether you are a slime mold, an annelid worm, or a Member of Parliament. We all use “G Protein Coupled Receptors” or GPCRs, a family of proteins that transmit information across the cell membrane. GPCRs have a charged N-terminal end on the outside of the membrane, seven fatty helices that span the lipid-rich center of the membrane, and a charged, water-soluble C-terminal end inside the cell. Mechanism by which binding of a small chemoattractant to a membrane surface GCPR releases messengers GTP and GDP, with subsequent activation of actin and myosin fibers via complex chemical pathways. See Kamp et al. for nomenclature and discussion. In slime molds and human neutrophils, activation of this mechanism causes the whole cell to rumble forward, “…creating actin-rich pseudopods at the front and retracting the back of the cell using myosin filaments…” This mechanism is detailed in Kamp et al’s just-published and very complex, but excellent, review article. In pond critters, this mechanism controls the direction and speed with which they swim toward a food source. The intracelluar architecture of this process is enormously complicated, and our understanding is in its infancy. Research on chemotaxis and directed locomotion raises more questions than answers once we get above the level of bacteria. Paramecia seem to display elements of the both the biased random walk and directed swimming. However, the mechanisms by which higher single-celled organisms interact with their environment are multifaceted, and much more complex than those used by bacteria. Protozoa are large enough that a chemical gradient outside the cell may be reflected in a chemical messenger gradient inside the cytoplasm from front to back; the recently-discovered complex phospholipid PIP3 may be involved in this process. In addition to releasing internal messenger chemicals, binding of chemoattractants to surface GCPRs causes depolarization and changes in the transmembrane voltage that control swimming (Valentine et al.). Receptors are probably distributed in specific areas over the cell membrane, and there is evidence that they can be synthesized quickly in response to stimuli. Cilia themselves are covered by specialized extrusions of the membrane, act as sensory organs, and have complex internal functions that involve molecular transport between the tip and base: “…cilia and flagella are micromachines and they act as cybernetic devices to receive, process and communicate information… (see Linck). Voltage changes in the ciliary membrane open calcium channels that affect the strength of the ciliary wave, altering direction and speed. Control of ciliary and flagellar beating, and hence direction and speed of swimming, appears to involve a complex and poorly-understood relationship between ciliary membrane voltage, calcium and magnesium ion movement, and intracellular released cyclicic nucleotides (cAMP and cGMP) (see Andrivon). Cilia may also be in part coordinated by a system of intracellular fibers and tubules. These mechanisms have implications for more than the wanderings of protozoa. A whole spectrum of genetically-coded diseases are now thought to be “ciliopathies“, or inherited defects in ciliary-associated functions. The body of research in all of these areas is vast and fascinating. Amazing that we can couple a little shadowy swarm in a cloudy bottle of water to such profound mechanisms at the root of our own existence! So what does all this tell us about our little watery veils of algae and dinoflagellates? The occurrence of these miniature swarms of protozoa is probably associated with a tiny, invisible patch of food. Chilomonas is a cryptomonad flagellate that has no pigment in its chloroplast (leucoplast) and must survive on soluble compounds. Its favorite carbon source is acetate, but it will survive equally well on succinate, and also gains nutrition from straight-chain fatty acids and alcohols (see Nisbet, p. 166). Both succinate and acetate are, however, produced under anaerobic (low oxygen) conditions, and would more likely to be found in sediments and ooze. Another attractant is more likely to be responsible. It is, however, interesting that the Chilomonas swarm was associated with a proliferation of bacteria. Were the Chilomonas slurping up waste products of the bacteria, or was it the other way around? With the other swarm, Dinoflagellates have enormously broad feeding behavior, ranging from photosynthetic species to predatory varieties, so understanding their swarming responses is more uncertain. Clearly, they were attracted by something in that small area, even though we could not see it. 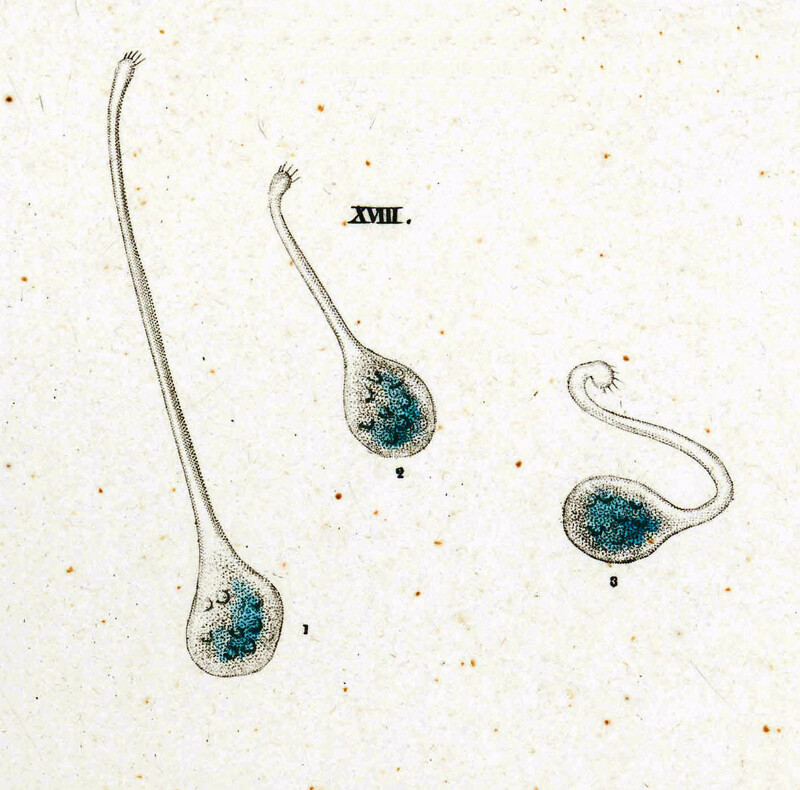 Protozoan schooling may be much more common than previously recognized. Even when present, protozoan clouds are very difficult to see with the naked eye. Like ribbons of smoke rising in the air, these delicate aquatic veils are apparent only with appropriate lighting, ideally from the side. They would be virtually invisible through the water’s surface in ordinary sunlight. Furthermore, they would form only in very still waters and be dispersed by even a gentle current. You are encouraged to look for these delicate structures next time you leave a bottle of pond water on the window sill. This is the beauty of natural science: a simple observation of phenomena in a bottle of muddy water opens a path to principles critical to the function of life itself. Discovering this delicate and fleeting phenomenon is a testament to the potential value of work done by dedicated amateur microscopists with careful observational skills and a desire to communicate their findings. Even modest equipment can allow worthwhile observations like these (done with a 45-year old Nikon S-Kt, a cell phone camera, and an international group of helpful fellow enthusiasts). Professional scientists are too often torn between teaching, grant writing, and gaining tenure, not to mention their own research (often farmed out to graduate students), to have time for interesting natural science. Research topics are often strongly influenced by what will be funded, and observing pond water is not often the best path up the academic ladder. The situation is similar in astronomy. A night of observing time on the Keck Telescope costs $53,700. Obviously, this is one good reason why new asteroids and comets are often detected by amateurs with basic equipment, time to spend, and no research committees to satisfy. As an example of the value of amateurs to astronomy, NASA is presently promoting a new program (part of the ORISIS asteroid sampling mission) to engage amateur astronomers in documenting new asteroids, an avenue of research that can now be done with a good 8″-10″ telescope and CCD camera. “Citizen Science” is well organized within NASA, and there are many established avenues for competent amateurs to make scientific contributions. Although scientific opportunities outside astronomy or established institutions are miserably infrequent (see Kathlyn Mills article in Wired-UK, and Bruce Bigelow’s still-relevant 1996 article in The Scientist), some formal opportunities exist for citizen scientists. Some of these may provide opportunities for microscopists. Citizenscience.gov is a federal web site sponsored by the General Services Administration and the Wilson Center; as of October 2016, it listed 303 federally-sponsored natural science projects needing citizen scientist participation. Europe has the European Citizen Science Association, and Australia has the Australian Citizen Science Association. More than anything, there is an enormous need for microscopists who will popularize this essentially unknown avocation. Microscopy is a better-known pastime in Britain, which has a long tradition in this area. In the U.S. and Canada, I am met with either fascination or blank looks. At best, I am viewed as a harmless eccentric; I worst, I am still waiting to be picked up by the police during my midnight marsh wanderings. There is a great need for people who will set up a chair and a portable microscope under a tree at a lakeside beach and wait for curious children and parents to congregate. Try it! This is a story about a little creature that isn’t truly microscopic. But it’s pretty small. And you’re gonna meet this little critter whether you like it or not. So don’t you think you ought to be introduced before you find it clinging to your socks? A haunted old tunnel, a tiny alpine marsh, and tiny creatures that traveled thousands of miles and shouldn’t be there. What more could a wandering microscopist need? Protozoological perambulations often lead to offbeat and fascinating destinations, of which Washington’s Iron Goat Trail – No. 1 on the 10 Most Haunted Hikes in Washington site and No. 6 on America’s Most Haunted Hiking Trails – truly qualifies. When the last spike of the Great Northern Railway was pounded home on June 6, 1893 in the little Cascade mountain town of Scenic, just east of Seattle, one of the greatest engineering feats of the nineteenth century was completed. The Great Northern Railway leaped the Mississippi River, steamed across the plains, and chugged through the Rocky Mountains. Just east of the little town of Scenic in northwestern Washington, it crept over its last obstacle, the Cascade Range, then through Stevens Pass and down the western slope to Seattle. The pass was a winter nightmare in the Cascades’ feet-deep wet snow, and the first crossing was via an intricate and treacherous series of switchbacks over the pass. The name of the Cascade Tunnel is still visible over the portal. Hooks held electrical wires to power fans. In 1900, completion of the Cascade Tunnel bypassed the switchbacks, but trains still fought severe winter conditions on high mountainsides. In 1910, storms stranded two trains at the little town of Wellington, just west of the tunnel’s mouth. Two days later, a vast landscape of snow broke free from the side of Windy Mountain above the railway, sweeping both shattered trains into Tye Creek with the loss of 100 lives. Many bodies were not recovered until July, and the Wellington Avalanche is still the worst avalanche disaster in U.S. history. This catastrophe, one of America’s worst railroad disasters, prompted the blasting of a new, 7.1 mile Cascade Tunnel at a lower elevation, replacing the old 2.63 mile tunnel with its overhanging mountain slopes. With the opening of the new Cascade Tunnel in 1929, the old lines were abandoned. Thanks to the efforts of many volunteers, the old lines and tunnels were recently reincarnated as the Iron Goat Trail, with the old Cascade Tunnel as its star attraction. I looked at the tunnel – I could see clearly 50 feet into the gloom. Another flash, another blur. Flash. Blur. Looked again. Clear tunnel. Flash. Blur. Night was falling, and this was getting truly creepy. Ghosts of dead engineers? Did someone or something not want to be photographed? Puzzled, I drove the dark mountain roads back to Seattle. Just by chance, my camera had pointed directly into a stream of tiny particles. Two weeks later, I returned armed with a powerful light, and was able to video an invisible mist of tiny droplets streaming out of the tunnel mouth. My poor camera had been trying to focus on this flow, and had failed miserably. Later images with a powerful lamp showed this flowing mist as a fine fog, streaming out of the tunnel like an invisible river. Naturally, I had some pickle jars in my pack, and naturally, I took some samples of mud and moss to put in soda bottle aquaria. What else do you do in a ghostly railroad tunnel? But another mystery quickly emerged in the form of tiny ovoid, grey to brown kernels, 3-8 mm across, appearing in the mat of fibrous dead vegetation: tiny clams! Moreover, these clams were doing very un-clammy things – like climbing plants, and inching up the side of the aquarium. And they were living in a fibrous mat of dead vegetation rather than staying decorously down in the mud! Search carefully for clams – they can be anywhere! So what are clams doing in a mountain pass at 4,000 feet? And a mile from a ski area where there is four feet of snow and freezing temperatures five months of the year? How did they get there, how do they survive in a mat of moss and roots under the snow, and why did they go there in the first place? Fingernail clams are thought to have originated in Eurasia, and are found worldwide in shallow lakes, slow-moving rivers, ditches, and ponds. In some German lakes, their density can reach over 76,000 clams per square meter, and they can burrow as deep as ten meters (USGS Fact Sheet). Officially, they reached eastern North America in the 1900s in ship ballast, but I’m convinced that they sneaked in the cellar window a long time before that. “…FnCs are tiny (most are less than ½”), but there’s a lot going on in that little bitty space. They are beige, smooth, thin-shelled creatures. They have a foot—a muscular appendage that they extend and contract in order to move ahead and down—but no head, and they have muscles that open and close their shell. They use a two-siphon system for feeding, breathing, and eliminating. Two, two-lobed gills are fastened on their ventral (lower) side… and they have sense organs that help them maintain equilibrium. Where the …. mantle sticks out past the shell edges, it can sense touch and light, and the FnC steers away from both. FnCs are filter-feeders, taking in oxygen and very small pieces of organic matter—mini-plankton and tiny pieces of leaves that were broken down by other leaf-feeders—through one siphon and releasing wastes and indigestibles through the other. FnCs are food for fish, crayfish, aquatic amphibians, waterfowl and shore birds. Their life span is a year or two. They are slightly more tolerant of pollution than other clams, and like other Mollusks, FnCs like water that is calcium-rich, the better to build shells with. They survive the winter cold and the seasonal drying of temporary ponds by retreating as deep as 8” (16+ times their body length) into the muck. If you happen to be pawing through the dead leaves in a dry depression in the woods in fall, the shells of dead FnCs will tell you that you are in a vernal pond. Young are produced all year long and the two to twenty offspring that result from each “reproductive event” are confined in the water tubes of the gills. The egg/offspring-swollen gill is called a marsupial sac or marsupium, and several cohorts may be present simultaneously. Mom/Dad provides nutrients that supplement the yolk material. Within each of those brood chambers, there are young of different sizes, because they don’t all hatch at the same time within the marsupium. Fascinating! But HOW did these clams make it up the side of a mountain range???? We know much about fingernail clams, but enormous riddles persist, especially regarding their almost inconceivable ability to travel. In North America, the USGS fact sheet claims only a coastal and Great Lakes distribution, but they are reported all over Kentucky and New England, and are significant in eastern Canada (Leung, 2015). In New England, they occur in large numbers in vernal (seasonal) woodland pools (see Susan Shea’s article “Clams in the Woods“); Ms. Shea suggests that they hitch rides on waterfowl, amphibians, mink, or even large insects. When these shallow woodland pools dry up during the summer, the clams burrow into the mud (Abugattas, 2015). Once transported to a new pond, their ability to self-fertilize permits a single tiny clam to populate an entire pool by itself. Golidad Farms, a Texas tropical fish hatchery, reports them suddenly proliferating in their hatchery vats. Elsewhere in the world, the National Biodiversity Network’s map shows them distributed across the British Isles, including offshore islands. Landcare Research lists them as a species in New Zealand. Despite the obvious fact that these tiny creatures have spread themselves across much of the world, most of what is said about fingernail clams’ ability to travel seems to be based on conjecture, with no published images or documentation of them actually accomplishing these epic journeys. However, I was fortunate – one day a tiny amphipod swam through a specimen with a minute, 2 mm clam clamped onto one leg. Although this unlikely pair disappeared into the weeds before I could grab my camera, clearly these tiny acrobatic molluscs CAN travel in this manner. Other mysteries persist: it is easy to imagine how a clam might reflexively clamp its shell onto a weed, foot, or mink hair, but if the clam is to climb a slippery stem or the smooth glass of an aquarium, the foot must attach to these surfaces. How do they do it? Is the foot inherently sticky, or does the clam use the suction of the siphon? Next time you pick up your pickle jar of mud and slime to look for Paramecia and Vorticella, pause and look for the slightly bigger critters. You may find them just as fascinating as what’s under your microscope! For a fascinating glimpse of images of the construction of the 1929 Cascade Tunnel, and life in the little town of Scenic, browse the University of Washington Libraries’ image collection for this site. Golidad Farms website. “Fingernail Clams.” http://goliadfarms.com/fingernail-clams-sphaerium-corneum/. Accessed January 5,2018. Nature Spot web site. “European fingernail clam – Sphaerium cornium”. https://www.naturespot.org.uk/species/european-fingernail-clam. Accessed January 1, 2018. Wellington, Washington Avalanche. From the Wikipedia website: http://en.wikipedia.org/wiki/Wellington,_Washington_avalanche. Accessed March 11, 2017. Imagine that you could eat lunch by just lying out in the sun? That’s what these green hydras (Hydra virdissima) are doing after moving from their Washington Park Arboretum pond to one of my small desktop aquaria. Green hydras are phototrophic, congregating in areas with highest light to energize their symbiotic green algae. These little fellows looped over and over up a stem to congregate at the top, which was about 2 cm below the surface under an LED desk lamp. Then they clustered together like tourists on a beach in Miami, soaking up the rays. My problem: How do I photograph this coelenterate tailgate party??? The little stem was about 3 cm from the glass, out of range of microscope lens-based magnifiers and too small to magnify well with a cell phone on macro. The macro setting on my old Canon point-and-shoot doesn’t go beyond 4X. I don’t have one of those new digital 10X microscope cameras. Nor do I have a bellows and sophisticated ultramacro lens for my digital SLR. So how was I to record this event? I used a Canon EOS digital SLR (half-frame sensor) with a Tamron 18-50 mm lens (about 35-85 mm 35mm equivalent) at ISO 1600, f/5 at 1/30 second and 50 mm setting. Then I added one of my favorite lenses, the Vivitar Series 1 10X macro close-up lens. The Vivitar Series 1 lenses are old 35 mm lenses dating from 1975-1995. Vivitar sold aftermarket lenses that they had made by various manufacturers. Consequently, the quality varied from mediocre to superb. A couple, like the 70-210 macro, became legendary and were some of the best lenses of the 20th century. The 10X closeup lens is a big old single hunk of glass that must be 1 cm thick in the center. Coated and sharp, it has nothing even resembling a flat field, but for non-planar subjects like flowers, insects, and wriggly pond things, it can create some superb images. It was typically sold in a set of four in a nice pouch; these can be found on Amazon or eBay for less than $20. Using this combination, I was able to do a 10X image from 3cm away through a light film of algae on the glass, then crop to about 15X. I used manual focus at maximum magnification, then took about forty images hand-held on a box through the plane of focus. I didn’t try stacking, as the arms move slowly. Posting this on Facebook’s Amateur Microscopy site brought up a number of responses, some enthusiastic and some dubious. This prompted the following thoughts on this lens, older lenses in general, and craftsmanship in photography, whether through the scope or out on the side of a mountain. In today’s world of computer-designed, aspherical lenses and automatic HDR, we can point even a medium-priced camera anywhere and create a high-quality, flat-field image with better shadow detail than I can see with the naked eye. However, in this world where almost any lens is better than the one Ansel Adams used, I think that we have lost a connection with our lenses and their quirks and individual character. And maybe we have lost an element of creativity, too. I too started work trying to buy the best and sharpest lenses I could find – Zeiss Sonnars and Tessars and Planars. Then I got into vintage cameras and found myself working with much simpler lenses. Every lens had its personality, and I found that I had to know every one like a member of my family. Then, I could make them sing – and in doing so, I stretched my own knowledge and creativity. These aren’t microscopic images, however, so what does this have to do with microscopy? The first point is, that even though this is a simple and imperfect lens, it provides an easy way to enter that important no-man’s-land between macro and micro. It is an extremely powerful lens that can let my camera work at a distance of 3-4 cm and still take images of tiny creatures like copepods and hydras. Most macro lenses won’t go to 10X even with extension tubes, and working distance is often short with other arrangements such as low-power microscope lenses. So restrict your subject to what works well with this combination, put the hydras or whatever in the center of the focal field, and think about what to do to make the rest of the picture look good – this is an exercise in creativity. Secondly, unlike more sophisticated cameras-and-bellows-and supplementary lens arrangements, it’s cheap ($5), rugged, and portable. The more complex arrangements ARE very good, and much more technically sophisticated. However, if the hydras come out to play while you’re in the kitchen, you can run upstairs, slap on this lens, shoot your pictures, and be back before the soup boils over. I’m living much of my life in hotel rooms, so everything has to be packable and rugged. The Vivitar is not perfect, but where else can you get a gizmo that lets an SLR photograph hydras, costs $5, doesn’t fall apart if you knock it, and can be slipped into your pocket to photograph bees and lichen on the side of a mountain in the rain? But you have to be willing to think creatively about when it will work and when it won’t, and you might just get an unusual image by thinking a step farther about how to make it all work. But it’s another example of how knowing your equipment and its craft, and really working with what it does and doesn’t do well, can let you do wonderful things with simple stuff. Don’t turn up your nose at a simple device until you really know how to use it. The CRITICAL point of all of this, especially for new microscopists who may despair of ever making good images or doing serious work, is that microscopy, like astronomy, is a field where worthwhile investigation can be done by serious amateurs with time to spend. Popular Mechanics published an article on the sophisticated contributions that amateur scientists working outside laboratories are making to modern science; note that one of them is a microscopist dealing with LED sources for fluorescent microscopes. Amateurs are making significant contributions to diatom research. And you may not need the most sophisticated equipment, either. A Zeiss scope with a full complement of planapochromat objectives is wonderful, especially if you are doing high resolution work. The ability to do dark field, phase contrast, and other alternative lighting mechanisms is highly desirable. Haake, A. “Inside Amateur Science: The Best in Out-of-Lab Research.” Popular Mechanics, Jun 10, 2009. Accessed Sept. 12, 2016. http://www.popularmechanics.com/science/a4343/4321192/. Rawlins Road, Skagit River Delta. Hayfields and roadside drainage ditches. Exploring the Skagit River delta north of Seattle on the weekend. Found this beautiful spot where hayfields had just been cut. 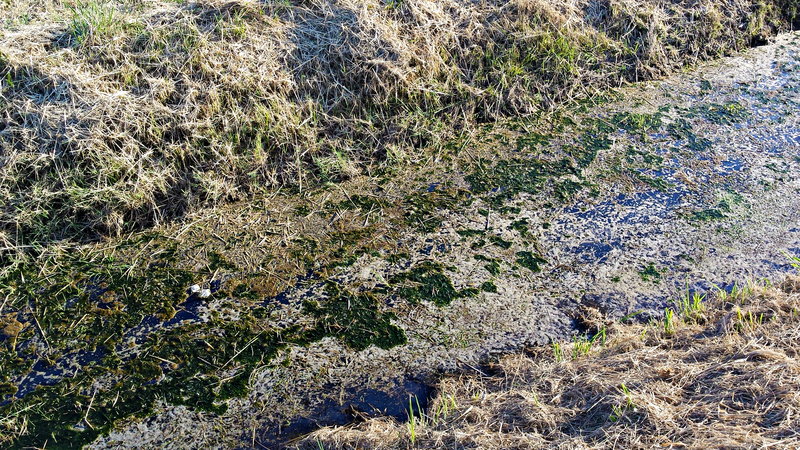 There is a drainage ditch on either side of the road (see image) that was full of hay clippings – looked like it had been there for several days. Roadside ditch – full of hay clippings, incubating for about a week. A delicious-looking soup! 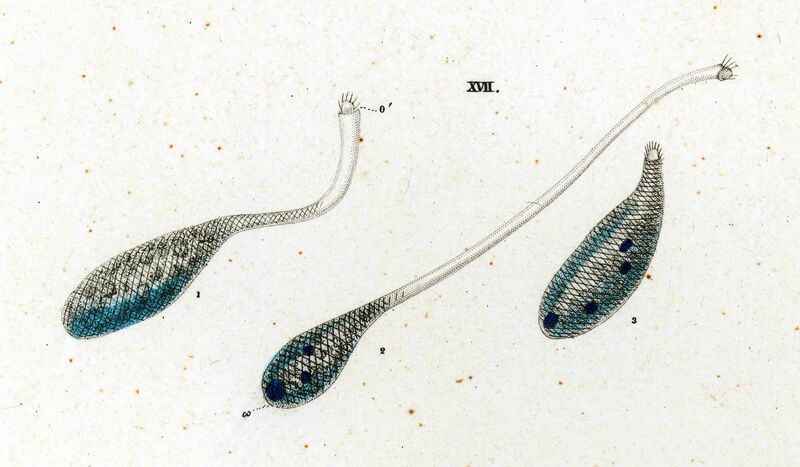 Images of Lacrymaria, from 1838 drawings by the German microscopist and naturalist Christian Gottfried Ehrenberg, 1795-1876. Fortunately, this sinuous monster is unlikely to remove a toe the next time you step in the lake – at only 1/10 mm (100 microns) in length, it is one of the smaller ciliates – but it makes up in ferocity what it lacks in size. Lacrymaria is one of the litostomate ciliates, tiny creatures with unique, highly-specialized mouth structures. “Litostomatean ciliates are predatory, with many extrusive toxicysts in oral area. They swallow algae, flagellates and ciliates and even rotifers. The cells are very mobile and some (e.g. Lacrymaria) show extreme rapid changes in shape.” (ref. : Rosati et al., J. Eukaryotic Microbiol. 50: 383, 2003). Courtesy W. van Raamsdonk, http://www.protozoa.nl. This class is diverse, and includes many carnivorous protozoa, other, anaerobic ciliates that live commensally in the gut of many species, and the only human ciliated intestinal parasite, Balantidium coli. Trichostomatia: Symbiotic ciliates in the gut of vertebrates. Also includes Balantidium coli, the only known ciliated intestinal parasite of humans. Rhynchostomatia: The most recently-created subclass, includes Tracheliida and Dileptida. The distinguishing characteristic of this subclass is the location of the mouth at the base of a long proboscis, the latter covered with cilia and possessing toxicysts used to stun prey. The Dileptids (e.g., Dileptus) are aggressive predators, “…equipped with a long, mobile proboscis lined with toxic extrusomes, with which they stun smaller organisms before consuming them…” (Wikipedia, Dileptus). 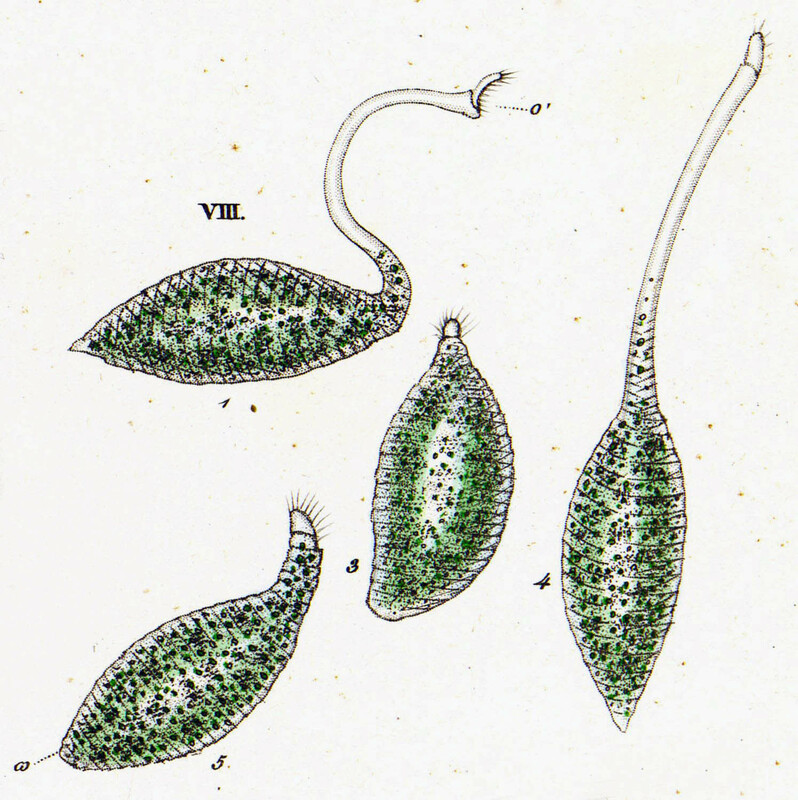 Dileptus‘ hunting habits have been described as “rapacious.” The Tracheliida are similar to the Dileptida but vary in the mouth structure and arrangement of cilia. Anyone who wants to understand this fascinating class of ciliates should not miss reading Vdacny and Foissner’s “Monograph of the Dileptids (Protista, Ciliophora, Rhynchostomatia)”(http://www.zobodat.at/pdf/DENISIA_0031_0001-0529.pdf). Although focused on the Dileptids, this exhaustive (529 pages), yet very readable treatise is inclusive, well-organized and thoughtfully written. It proves much information, as well as many drawings and images, of ciliate ultrastructure, that generalize to the structure of all protozoa. If, as I have, you feel discouraged and ignorant because you struggle to classify tiny creatures neatly into phylum, class, order, family, genus and species, take heart. Genetic analysis has made thousands of hours of academic study and morphological classification completely irrelevant. Careful classifications based on overall anatomy, ciliary structure, or the gonadal morphology of worms have been turned on their heads. See Wikipedia’s article on taxonomy to appreciate the evolution of this science, and the degree of present-day flux in our thinking about the slots into which we put the living world around us. We have a much improved understanding of the structure of the Tree of Life. This does not, however, mean that this new information has simplified the life of the microscopist. All but the most general classification systems are morphing continually as branches die off and new limbs grow. 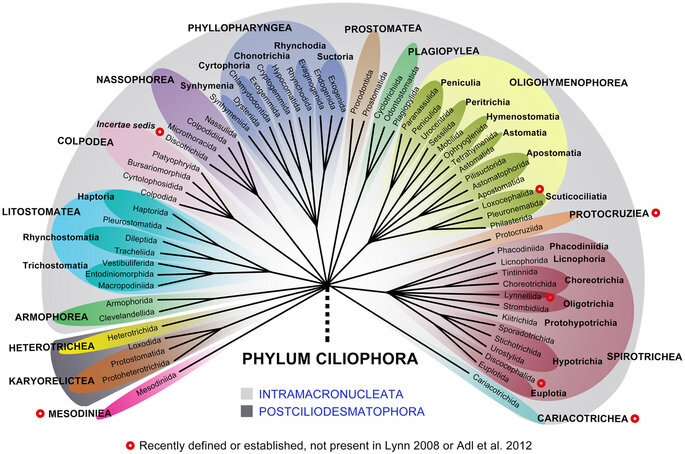 Those still suffering from an inferiority complex should consult the papers by Gao et al or Zhang et al’s “Insights into the phylogeny of systematically controversial haptorian ciliates based on multigene analyses” and admire the beautiful, multicolored taxonomic trees and RNA maps. These would look lovely on a wall or embroidered into seat covers, but tend to induce stomach pain in anyone short of a graduate-level genetic taxonomist. I often tell students, “If you are confused, and think that nothing about this subject makes sense, it may be that you understand the topic.” If you are confused, it may be that the subject is confusing rather than that you are stupid. This is true of most of protozoan taxonomy today. If you don’t understand the scheme, wait until next Wednesday and it will probably be different. You are better to learn the 36 presently accepted phyla, get a general idea of the different classes of water creatures, learn the common species, then enjoy the pretty animals. Often, just separating an acorn worm (Hemichordata) from an annelid (Annelida) or a thorny-headed worm (Acanthocephala), or distinguishing a Stentor from a Vorticella (and maybe a couple of species of each) is as far as most of us have time to go. The reader is referred to David Goldstein’s Micscape article, “The Classification of Living Things” for further thoughts on this topic. Those who want to feel much better about their humble understanding should peruse Walter Dioni’s well-researched article, “An Annotated Key for Species of the Family Stentoridae and Two Related Families: An Excursion Through the Taxonomic Maze” and muse on the torturous progression of the taxonomy of the simple Stentor. If you are STILL feeling badly, carefully read Vd’acny’s recent (2013) paper “The Chaos Prevails: Molecular Phylogeny of the Haptoria (Ciliophora, Litostomatea).” and make sure that you take CAREFUL note of Figure 5. Then consume a moderate quantity of hydroxylated ethane, go to bed, and pull the covers over your head for an hour. When you emerge, you will feel better with the knowledge that much smarter people than you struggle with taxonomy and are busy messing up everything that you THINK you know, so why bother? Ehrenberg, C.G. Die Infusionsthierchen als vollkommene Organismen, Vols I & II. Leipzig, 1838. Since microscopists frequently spend hours looking at specimens, the question of the safety of LED illumination is significant. Concerns regarding the possible damaging effects of blue and ultraviolet light after conversion of scopes to LED light sources have been raised by several authors describing conversion techniques. Traditional incandescent light bulbs produce most of their illumination in the red or far-red end of the spectrum, with modest output in the visible range and minimal ultraviolet production. Consequently, incandescent light that is comfortable to observe is unlikely to cause damage. This is not necessarily the case with an LED light source, where shorter-wavelength blue light excites a phosphor to produce a second peak of mid to longer visible wavelengths. The latter is less likely to be injurious to the retina unless the light intensity is high, but the UV component and the amount of primary-emission blue light are often poorly characterized. Rhodopsin crosses the cell membrane seven times and contains the pigment Retinal (red) in a small pocket. Cones, the color-sensitive photoreceptor cells, are less sensitive, are the primary cells responding to daylight light levels, and have three chromophore pigments, L, M, and S, responding respectively at 564nm (Long wave, red), 534nm (Medium wave, green) and 420nm (Short wave, blue). The normal human eye is therefore populated by L, M, and S cones. The mechanisms of retinal damage by light are complex and incompletely understood, and the literature on this subject is both enormous and confusing (see Organisciak and Vaughan as well as Youssef et al). Two broad categories of damage are recognized: thermal damage and photochemical damage. Thermal damage reflects heat-induced retinal damage and can occur across a fairly broad range of visible wavelengths, but requires significant intensity. At very high light intensities with focused spot retinal heating, shearing and mechanical effects from heating of the aqueous components can also become a factor. Both effects are of concern with powerful sources such as infrared YAG lasers, but should not be a significant risk to the average microscopist. Photochemical damage is of more concern; the risk for this form of retinal injury is concentrated in the shorter wavelengths (i.e., blue and violet) of the visible spectrum and peaks in the ultraviolet. There also seems to be some photochemical damage that can occur in the midrange of the visible spectrum as well; this is likely to reflect energy absorption and subsequent chemical reactions by the chromophore pigments. The human eye is protected from much of the effect of high levels of visible light by the aversion response – pupillary constriction, head turning, and blinking. In other words, bright light hurts, and we respond reasonably quickly, reacting protectively in about one-quarter second. This response offers considerable protection from light that we can see. Unfortunately, the effectiveness of this reaction decreases significantly on both ends of the visible spectrum. Infrared light passes readily through the corneal and vitreous; on exposure to a powerful Nd:YAG infrared laser, the patient may feel only a “pop” as focal explosive boiling creates a permanent blind spot. Similarly, the aversion response to blue or violet light is weak, and the eye has no significant protective response to ultraviolet wavelengths. Research results and published opinions are contradictory. Much work has been done in this area, as light-induced damage mimics many of the features of chronic degenerative processes such as macular degeneration, and chronic light exposure may be a factor in these processes. Some studies have used very intense exposures and may not be good models for the effects of long-term, lower-level blue or UV light exposure levels. In 2013, the US Department of Energy published a fact sheet on architectural light sources that stated “…LED products are no more hazardous than other lighting technologies that have the same CCT (color temperature)…” Then in 2015, a French research team published a highly sophisticated study showing biochemical and structural damage in the retinas of rats exposed to overhead LED illumination. Sources used included white and blue LEDs from Cree Industries and Nichia Corporation. Note on learning new things: I should really admit that, like much of my writing, I started off in complete and utter ignorance of all three of these topics. Furthermore, I have never actually DONE an LED conversion of a classic microscope. Like much of what I write, this series is a notebook of my learning process – a reflection of how I organize my thinking so that new information falls into order, like shiny ornaments on a well-designed Christmas tree. Since I’m doing all this work, I might as well write it down so others can share it. I’m also driven by my own curiosity and sense of fun at learning new things that I can use on my own projects. It should also be noted that complete ignorance of a topic has never stopped anyone from loudly expressing an opinion or writing voluminously about it. If you doubt this, listen to any politician. Zhou, X. E. et al. “Structure and Activation of Rhodopsin.” Acta Pharmacol Sin. 2012 Mar; 33(3): 291–299.